One of the traditions of the Mt. Olive New Year’s Eve Pickle Drop is the canned food drive for Food Bank of Central & Eastern North Carolina. And this year, in the aftermath of Hurricane Matthew, the food drive is even more important. 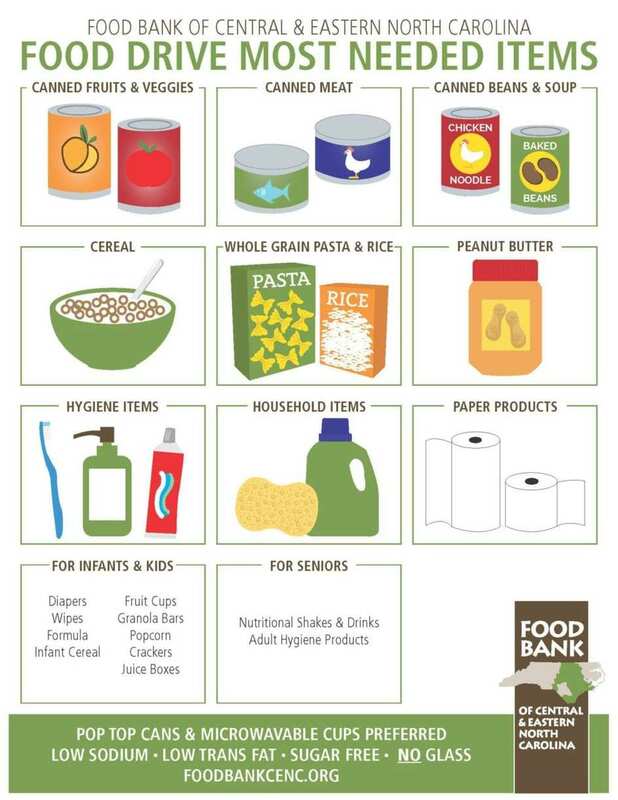 See the list of most needed items. Food Bank CENC serves 34 counties through 800 partner agencies. In the weeks after Hurricane Matthew, it distributed over 2 million pounds of disaster relief food, water, and supplies, in addition to its regular distributions. As part of the pickle drop tradition, people who bring canned food or make cash donations to the Food Bank receive a chance to win door prizes. The grand prize is a three-foot pool pickle like the one that is dropped down the company flagpole. The door prizes are awarded immediately following the drop. The Pickle Drop has partnered with Food Bank since 2007, and has provided 10,000 meals in food and financial contributions since then. Mt. Olive Pickle Company, Inc. will hold its annual New Year’s Eve Pickle Drop Saturday, December 31, 2016 at the Corner of Cucumber & Vine in Mount Olive. Live music will start at 5:30, and the evening will also include line dancing and free refreshments. The pickle comes down the pole at 7 p.m. – which is midnight GMT. “We always encourage folks to get here early. The whole thing is over at 7:05 – or as soon as we award all the door prizes,” Ms. Williams said. The company’s gift shop will be open that day from 3-7 p.m. For driving directions to Mt. Olive Pickle, go to www.picklemap.com. For those who can’t make it in person, watch it live on New Year’s Eve on the web at www.mtolivepickles.com. In business since 1926 in its hometown of Mount Olive, NC, Mt. Olive Pickle Company manufactures the best-selling brand of pickles, peppers and relishes in the country.